It was 2010 and I was buying my first home; this was before I was a REALTOR®, before we started The A-Team, and before I was a specialist buyer’s agent. It was before I knew what I was doing. In fact, I was a bit of an idiot: I was young. That in itself is no problem. The truth is, I was ridiculous and a poor decision-maker at that time. Today, in my job, I meet intelligent, young people all the time who are extremely respectable, and amazing at life. I was not one of those. This isn’t about you. It’s about price, terms & conditions. That is, if you are purchasing a home, then the objective is usually to secure the lowest possible price (hopefully below value), and with an acceptable level of protection in the contract. If you are selling, it’s about selling for top dollar, and keeping the contract as neat as possible to remove the risk of the sale falling through. I was young and I thought I knew it all (which I didn’t). This was a big reason why I offered such a low price off the bat. This is closely related to #1. If you find an agent you trust, and you are the sort of person who is good at delegating, then you will do well in real estate. The reason is that agents, especially ones who are very active in the market, simply know more than you. 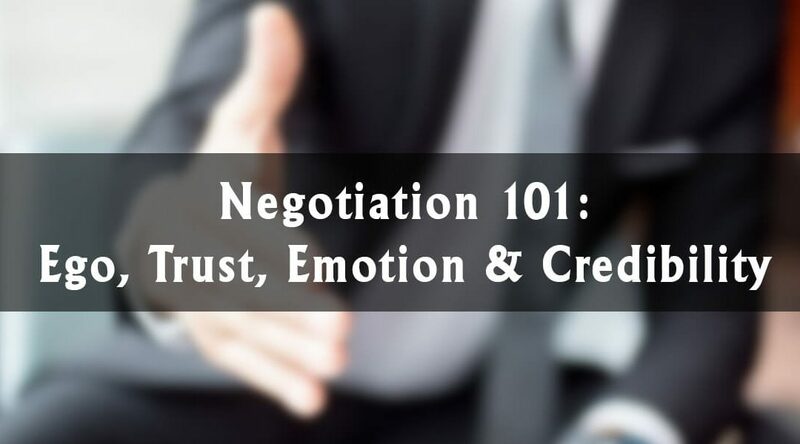 So if you can build a trusting relationship, one which you can rely on in the heat of the moment, then you’re more likely to win the negotiation. I didn’t trust anyone: I remember my agent reading me the fiduciary duties (namely the one about it being the law that they look after only my best interests), and I was thinking “yeah right”. It’s crazy to think how much things have changed for me. Today, my career life depends on those duties, and the deeply trusting relationships that we build day in, day out. Real estate is naturally very emotional. If you are selling your cherished home full of memories, then you know what I’m talking about. If you are a first-time buyer who has saved your down payment for years, then you know, too. There are large sums of money involved (life savings, actually). But it doesn’t have to be a rollercoaster. We have found over and over that, as agents, the more we can help remove the emotion from the transaction and just keep it to business, the more successful you will be. We’re here for you (we’ll listen like a therapist when you’re stressed), but if you can interpret information as scientifically as possible, and act on it in a way that is in your best interests, then you’ll do better. I knew that the home I was bidding on was worth close to the list price. I knew it was the only option on the market for me. And I knew that home values were going up. But it didn’t stop me low-balling because for all I thought I was “Mr Logical”, I was actually a passionate young dude thinking with his heart, not his head. You only get to bluff once. On the buyer side: Once your offer is rejected and you offer higher without the other side coming down, you’ve lost your credibility. Or once you say “final offer” then come up higher and say “final” again, you’ve lost it. Once your credibility is gone, you’re going to get taken to the cleaners by the client on the other end of the transaction, especially if they have an experienced real estate agent (which most do). I made the most classic mistake of all: Losing my credibility. I huffed and I puffed, and I made a huge mess of things (as you will see). Unlike the first three lessons, this is one that I find is very common and natural. Without really good guidance, even trusting, non-emotional, calm people will regularly lose their credibility and negotiate too aggressively, likely to their own detriment later. This means coming in too low as a buyer, or rejecting your first offer as a seller in a falling market. It often results in using “final offer” too lightly. If you do happen to secure a pending contract, wouldn’t it be nice to have your credibility still intact for the property inspection negotiation? Every negotiation is different because it’s based on a different set of circumstances. There are different homes, clients, personalities, objectives, etc. But some principles hold true in all negotiation, and I think these are them. I know that you will systematically buy properties for less, and sell them for more. Tom Albrecht leads The A-Team with his wife, Breanna, and is a Buyer’s Agent. He holds a Masters in Economics for Developing Countries from The University of Oxford. Buying Wood Foundation Homes: Are They a Good Idea? Disclaimer: The A-Team is a team of associates at Walsh Real Estate (2010) Ltd o/a RE/MAX® Fort McMurray, 9919 Biggs Avenue, Fort McMurray, Alberta, T9H 1S2. Each office is independently owned and operated. The licensed associates are Tom Albrecht, Breanna Albrecht, Aaron Chalmers, Erin Ogren, Heather McCandless, Rita Sobkowich, and Denise Hildebrand. Eric Dunham, mortgage specialist with RBC®, is not affiliated. We also recommend Jennifer Aulenbach at CIBC® and Barb Pinsent at Mortgage Architects®.